Doctor has great demeanor, took care of my daughter's podiatric problem. Always a pleasurable experience at Dr. Joseph' Office; She and her staff are professional, yet down to earth... Can't ask for a better patient experience! I like this doctor a lot. She is very knowledgeable in her field. I would recommend her to anyone. She and her assistant put me completely at ease as I was extremely nervous. The treatment was quick, pretty much painless and I would recommend her to anyone. Caring, competent, helpful and pleasant. Great experience. She relieved my pain immediately. She's the best. Robyn Joseph was kind, patient, professional, and educated us in great length. She was kind, professional. and explained to my understanding. Very nice doctor and she was very thorough and explained everything in complete detail! Dr. Joseph was very nice, and knowledgeable. I felt totally confident in her care. I would highly recommend her. Very pleased and a very professional office. Quick and professional. Offered excellent advice about an upcoming vacation, I.e., to get compression socks for a long air trip. I found her a little intimidating and controlling. We did not know a lot about the procedure we were going in about and had a few hesitations. I did feel a little pressured to continue on with a procedure we werenot quite ready for and not many other options were provided. She DID however get the job done well and she was professional and quick. I think I prefer people with a gentler approach, but that may just be my own personality conflict. I do think she is very good at her job and definitely knows her stuff, just a bit more forceful in personality and may not give you too much room to question or ask for something different. Also she did not seem overly sympathetic to pain. Dr. Joseph was very nice and made me feel comfortable. I'm usually very anxious when it comes to my feet but she was completely gentle and made me feel relaxed. Dr. Joseph was amazing. She explained everything, educated me about what was going on with my foot and was very patient. I really appreciated her bedside manner and her knowledge. I would recommend her to anyone and will keep her as my podiatrist from now on!!! Dr. Robyn Joseph was amazing. She took care of my foot issues in no time at all and made the whole process go smoothly. 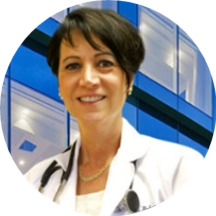 Dr. Robyn Joseph, DPM has no appointments on Zocdoc right now.